Dumneazu: Pizza: The Cradle of Mankind. Pardon us for dwelling so long on our recent trip to Italy, but as I said, while we were in New York we managed to stuff ouselves on just about everything except Italian food, so we had to make up for it in Milano. Milan, unlike most of the Mediterranean world, is generally too busy to take a serious siesta break in the middle of the day, and with so many people running from workplace to workplace, the Milanese have taken quick eats to the level of a sublime art. 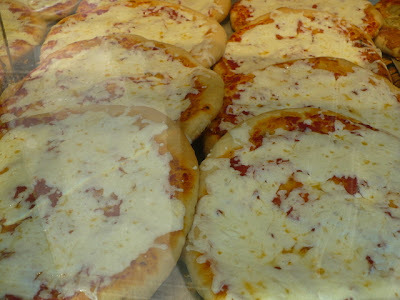 As anybody who has been to Italy knows, the pizza is usually different in every region. The big flat american pie has its origins in Naples, and sure enough, when one goes out for a sit down pizza in a place that has tables and waiters the Neapolitian pizza is usually what you get: smaller than the american version, usually with a thinner crust and served as a single meal in itself. 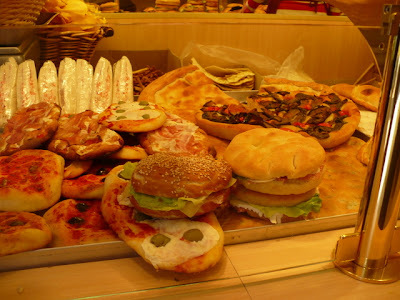 Most pizzas are bought at local bakeries for take out or reheated in the shop to eat standing up. This is where cold pizza for breakfast takes on a new and elegant meaning. 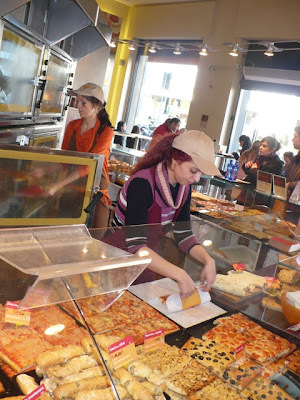 In the US, a square, doughy pizza is usually called a Sicillian pizza, but all over Italy you find combinations of toppings and different styles of flat breads popping up in pizza bakeries. 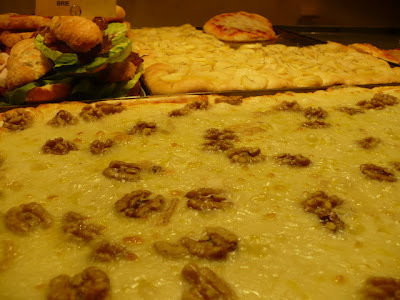 The white pizza seen above was in a shop just outside of the main square in Bergamno's upper town: onions, mushrooms, and potatoes with fontina cheese. White pizza with walnuts. If a tour bus full of squirrels shows up, this place has them covered. Uncommon pizza toppings like this are no idle culinary experiment, however. Nobody in Italy really experiments with food on a molecular level. If you see food for sale it is pretty well guaranteed to taste good. Italians wouldn't do business if these things didn't sell. And they do sell. Fumie discovered the cheeseless pizza on this trip, seen above. Tomato sauce, olives, but no cheese, a new way to experience pizza for us. A corner pizza palace in Milan during lunch hour. 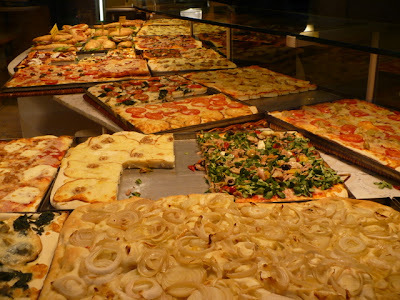 About fifty different pizzas, including focaccia and paninis, are laid out. Choose your pizza, and they toss in a sweet pastry and a drink for EU 3.30 At noon the place is almost deserted... an hour later you can hardly move for the crowds inside. 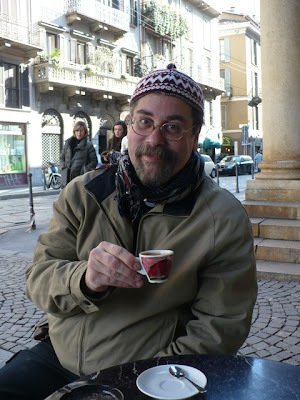 Later, my friend Igor - a deep well of knowledge for everything Milanese - met us downtown at the Duomo one afternoon, which is not a part of Milan known for good, cheap eats. Never fear, Igor is here! 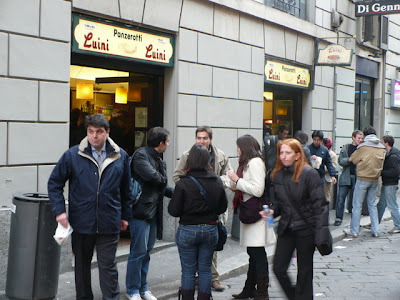 Just behind the Galleries, next to the posh Rinascente department store is a small bakery which specialized in panzeroti, cheap little folded pizzas from Puglia. Obviously, a lot of locals know about the place - everytime we passed it had a line going out the door. 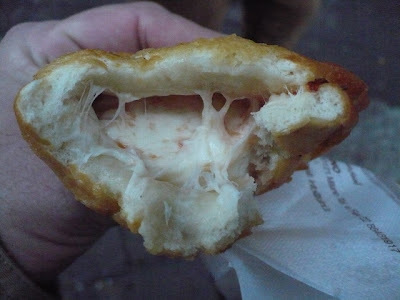 Panzeroti are like miniature calzones, only better, stuffed with soft mozzarella and a bit of fresh tomato. 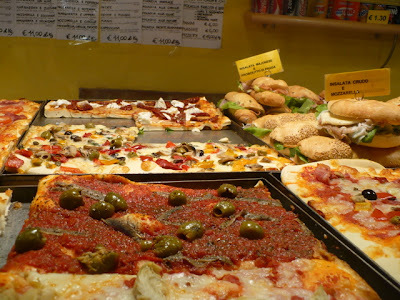 Yes, you can eat well in downtown Milan for under one Euro! And since walking around is what we do best, there is also time for coffee. In Italy, coffee prices - for the single shot of expresso, at least - are standardized by the State. Wherever you go a small espresso coffee is .90 Euro cents. Make that a capuccino or a caffe lungo and the added labor and ingredients add to the price of the shot. Usually, if you sit down you pay a surcharge for the seat, but at this small cafe we were granted free street seating. Nothing beats a free seat. I can't decide if this post is wonderfully generous or exceptionally cruel! The photos and descriptions are mouthwatering!